Legumes are typically seen as a free source of nitrogen. Research suggests that an optimally performing legume can provide about 25 kilograms of nitrogen for every tonne of dry matter grown per hectare, released slowly over three years. Adequate performance is indicated by a legume root system covered with lots of small, and several large, pink nodules. Unfortunately, this level of performance is not very common. 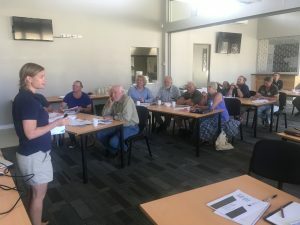 The bad news was relayed at a recent workshop in Nannup by MALDI-ID Director Dr Sofie De Meyer, who described a survey in the NSW’s Riverina region that found 93 per cent of samples had unhealthy or ineffective nodules. The situation in WA is likely to be similar, and begs the question: Do farmers know how much nitrogen they aren’t fixing? The answer to that question lies beneath the soil. Dr De Meyer explained how farmers can carefully dig up and wash several legume roots to assess performance using a nodule scoring system. Scores below four (over a scale of 0-8) are considered to be unhealthy. If assessment confirms that a problem exists, farmers can start to diagnose the cause by firstly determining whether the most effective strain of rhizobia is present in roots. Rhizobia, or root-nodule bacteria, establish mutually beneficial relationships with legume roots to fix nitrogen. Rhizobia occur naturally in soil but the genera is genetically diverse. Different strains of rhizobia vary in how effectively they associate with different legumes so commercial inoculants have been developed that contain specific strains of rhizobia that optimise nitrogen fixation for specific legumes. Dr De Meyer has developed a method to identify root nodule bacteria and determine if the best strain is present. But the chance of having WSM 1325 is low if clover pastures haven’t been inoculated since 2005. And those that have been inoculated since 2005 may have since lost genetic purity because introduced strains interbreed readily with native rhizobia in the soil. In some cases, the introduced strain is not detectable three to five years after inoculation. But before farmers run out and inoculate pastures with the best inoculant, they need to consider whether soil conditions are suitable for its survival. The sensitivity of rhizobia was also described by Dr Neil Ballard from Global Pasture Consultants, who spoke at the Nannup workshop about inoculating pastures. Dr Ballard pointed out that even applying inoculant with molybdenum was a potential threat because only two forms are considered safe to use -molybdenum trioxide and ammonium molybdate. But perhaps the biggest threat to survival during inoculation is desiccation. The problem of keeping rhizobia alive was demonstrated in surveys conducted by the Australian Inoculants Research Group (AIRG), which found that virtually no pre-coated seed samples older than 50 days met minimum standards (Inoculating Legumes: A Practical Guide). For growers with plenty of clover seed in the soil bank, Dr Ballard suggested that direct drilling a granular inoculant into the soil at the break of season could be effective. Alternatively, growers could use a peat slurry inoculant, which is considered the cheapest and most effective method, on small seeded varieties such as canola to introduce the inoculant into the seed bank as it germinates. Dr Ballard finished by recommending all farmers learn what is happening below ground by digging up legumes six to eight weeks after germination and before flowering to score nodules. “There is a huge saving in nitrogen from pasture legumes, but it could be more if we fix more efficiently,” he said. Video summaries of Dr De Meyer’s and Dr Ballard’s presentations are available at the “SWCCNRM” YouTube channel. For further information, download “Inoculating Legumes: A Practical Guide” from the GRDC website. This workshop was part of the new Smart Farms Small Grants project “Soil constraints in high rainfall beef pastures”, supported by the South West Catchments Council, though funding from the Australian Government’s National Landcare Program, and in partnership with Western Beef Association Inc.
For more information on the workshop and project, contact Jeisane Accioly on 0403 327 216.